This article was published in the print magazine Drupal Watchdog , Volume 3 Issue 1, 2013-04 , on pages 28-29, by Tag1 Publishing. The magazine was distributed at DrupalCon Portland, 2013-05-20 . The article was also published on their website. 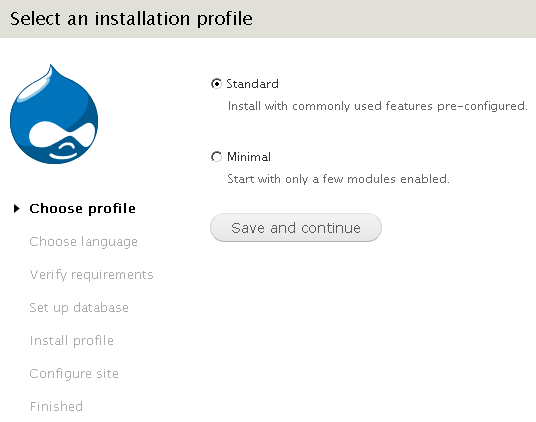 An installation profile comprises a set of files that completely describe how to configure a new installation of Drupal core, and can be made part of a distribution. 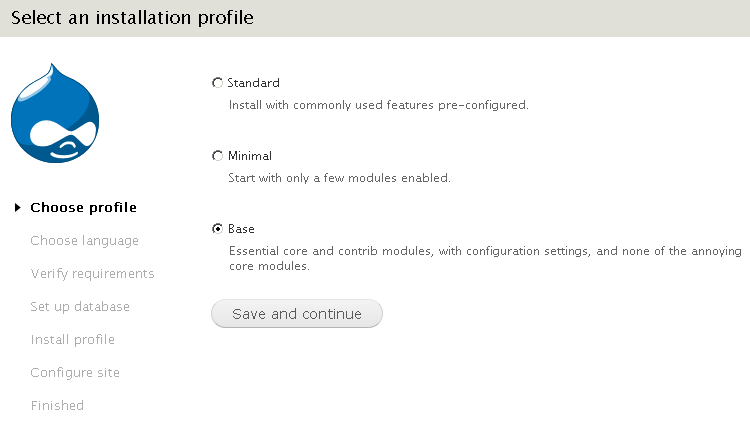 The Drupal 7 installation screen mentions that the Standard profile offers "commonly used features pre-configured". These include longstanding modules such as Color, Comment, and Search — as well as new ones such as Dashboard, Overlay, and Shortcut. The Standard profile includes the pre-built content types Article and Basic page, an administrator role, and even a taxonomy vocabulary (Tags). But what if you don't want most, or even any, of these preliminary settings chosen for you? You could instead opt for the Minimal profile, and add all your customizations on top of it each time you build a website. This could entail a lot of effort and time, clicking your way through GUI screens — downloading and enabling modules, and making numerous configuration changes. Instead, it would be convenient to be able to capture all of these actions and settings in your own distribution. In this article, I will show how to do that. This topic is best explored through example, and so I will build a distribution containing settings I have found to be valuable as a starting point for most new client websites. Aside from a Drupal core and its usual technical requirements, the only other web technology you need installed on the server is Drush. The first step is to create and configure the Drupal website to be exactly the way you want it in your distribution. 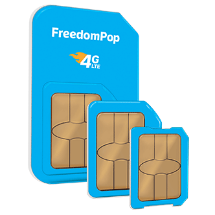 In our example, I download and install the latest version (7.17, as of this writing), and use the Minimal installation profile, in order to minimize the amount of subsequent changes that need to be made. For performance reasons, I typically use database logging only when appropriate for the project; so I disable the core module "Database logging". I enable nine must-have core modules: Contextual links, Field UI, File, Image, List, Menu, Number, Options, and Path. The next step in the process is to create a makefile, which is a manifest file formatted in the standard Drupal ".info" syntax. The makefile starts with a Drupal core version number, which can optionally start with a specific release number; otherwise, the most recent stable release is automatically chosen. It then specifies the Drush Make API version (in our case, 2). The bulk of the makefile specifies all of the contrib and custom modules used in the installation, as well as contrib libraries. Each contrib module entry can have a version number, if desired. (I will exclude all version numbers.) It can also have a path to a Git repository, local or remote; otherwise, Drupal.org is used as the source for downloading. Similarly, each custom module must have a Git path (e.g., on GitHub). Our distribution is intended to serve as a foundation upon which to build new websites, so let's call it "Base". Test the installation profile, to verify that it is now an option when re-installing the website. The final step in creating the distribution is as follows: drush make --prepare-install --tar base.make base This command generates a tarball, base.tar.gz, in the root directory. It also creates a settings.php file with secure permissions, and a files/ directory. Copyright © 2012 Michael J. Ross. All rights reserved.